The most recent advancement in fibers and textiles is a type of soft hardware that can be worn—cloth including electronic devices incorporated directly into it. 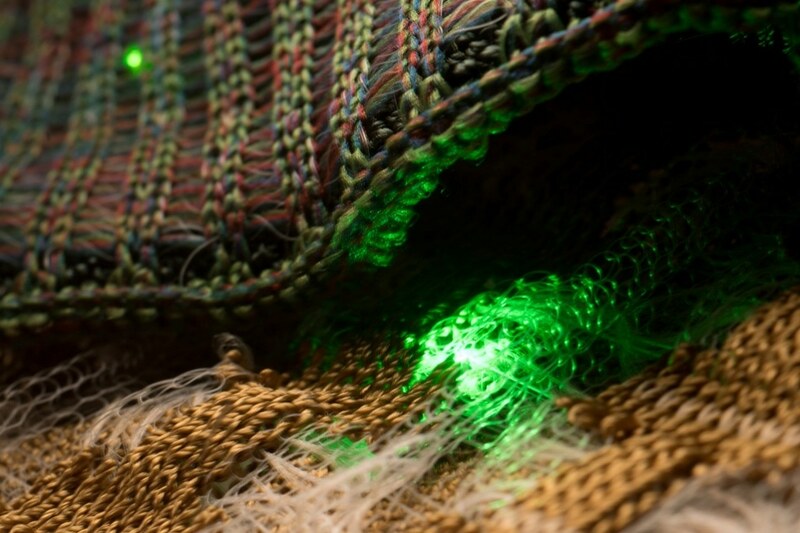 At present, scientists at MIT have integrated high-speed optoelectronic semiconductor devices, such as diode photodetectors and light-emitting diodes (LEDs), inside fibers that were subsequently woven at Inman Mills, in South Carolina, into soft, washable fabrics and transformed into communication systems. This indicates the accomplishment of a long-pending goal of developing “smart” fabrics by integrating semiconductor devices—the main constituent of modern electronics—which was the missing piece for producing fabrics with advanced functionality. The scientists stated that this finding could unleash a new “Moore’s Law” for fibers—put differently, a rapid advancement in which the potentials of fibers would grow exponentially and rapidly over time, quite similar to the way in which the potentials of microchips have grown over several years. The outcomes of the report have been are reported in the Nature journal in a paper by former MIT graduate student Michael Rein; his research advisor Yoel Fink, MIT professor of materials science and electrical engineering and CEO of AFFOA (Advanced Functional Fabrics of America); along with a team from MIT, AFFOA, Inman Mills, EPFL in Lausanne, Switzerland, and Lincoln Laboratory. Conventionally, optical fibers have been synthesized by producing a cylindrical object known as a “preform,” which is typically a scaled-up model of the fiber, and then heating it. Then, softened material is drawn or pulled downward under tension and the ensuing fiber is collected on a spool. The most important advancement in synthesizing these new fibers was the addition of light-emitting semiconductor diodes to the preform—where the size of the diodes is equal to that of a grain of sand—and a pair of copper wires with a width equal to a fraction of the width of a strand of human hair. Upon heating inside a furnace at the time of the fiber-drawing process, the polymer preform is partially liquefied, thereby forming a long fiber with the diodes lined up along its center and linked by the copper wires. Here, the solid components were two kinds of electrical diodes developed with the help of standard microchip technology: photosensing diodes and LEDs and. “Both the devices and the wires maintain their dimensions while everything shrinks around them” in the drawing process, stated Rein. Then, the ensuing fibers were woven into fabrics, which were laundered 10 times to demonstrate their applicability as prospective material for clothing. This approach adds a new insight into the process of making fibers. Instead of drawing the material all together in a liquid state, we mixed in devices in particulate form, together with thin metal wires. Neuromorphic Vision Systems, will they make Traditional Machine Vision Systems Obsolete? One of the benefits of integrating function into the fiber material itself is that the ensuing fiber is intrinsically waterproof. In order to establish this, the researchers placed some of the photodetecting fibers inside a fish tank. A lamp positioned outside the aquarium transmitted music (suitably, Handel’s “Water Music”) to the fibers through the water in the form of rapid optical signals. The fibers in the tank transformed the light pulses—so quickly that the light seems steady to the naked eye—to electrical signals, which were subsequently transformed into music. The fibers endured in the water for weeks. Despite the simple outlook of the principle, it has been a long and challenging process to make it work consistently and to make sure that the fibers could be produced in large quantities and in a reliable manner. Staff at the Advanced Functional Fabric of America Institute, headed by Jason Cox and Chia-Chun Chung, created the pathways to realize an increase in throughput, yield, and overall reliability, rendering these fibers ready for transitioning to industry. Simultaneously, Marty Ellis from Inman Mills devised methods for weaving these fibers into fabrics with the help of a traditional industrial manufacturing-scale loom. He stated that the first commercial products based on this technology will hit the market next year—an exceptionally short advancement from laboratory study to commercialization. Such a quick lab-to-market progression was an important part of the reason for developing an academic-industry-government collaborative such as AFFOA in the first place, he stated. The initial applications of the fibers will be specialized products in the fields of safety and communications. “It’s going to be the first fabric communication system. We are right now in the process of transitioning the technology to domestic manufacturers and industry at an unprecendented speed and scale,” he stated. The researchers stated that in addition to communications, the fibers could prospectively have important applications in the biomedical field. For instance, devices incorporating such fibers could be used to develop a wristband with the ability to measure pulse or blood oxygen levels, or be integrated into a bandage for continuous monitoring of the healing process. The study was partially supported by the MIT Materials Research Science and Engineering Center (MRSEC) through the MRSEC Program of the National Science Foundation, by the U.S. Army Research Laboratory and the U.S. Army Research Office through the Institute for Soldier Nanotechnologies. This study was also supported by the Assistant Secretary of Defense for Research and Engineering.